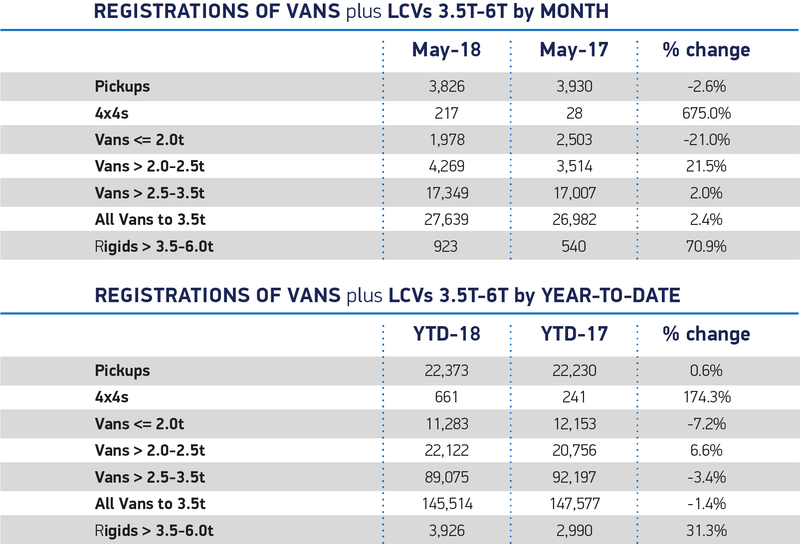 The light commercial vehicle (LCV) market remained steady in May, rising 2.4%, as 27,639 new vans hit British roads, according to figures released today by the Society of Motor Manufacturers and Traders (SMMT). Demand for mid-size and larger vans grew by 21.5% and 2.0% respectively, helping offset a -21.0% decline in smaller vehicles weighing less than 2.0-tonnes. Pick-ups also fell, with 3,826 registered in the month, down -2.6%. Following five months of fluctuations, 2018 year-to-date performance is down by -1.4% on the same period last year. However, with 145,514 vans and pick-ups registered so far in the year, demand remains a third (34.8%) higher than five years ago.